Sandringham House (west front, 2018), largely designed by Albert Jenkins Humbert. Humbert had previously rebuilt St Mildred's, Whippingham for the Prince Consort near Osborne, on the Isle of Wight, and was still engaged on building the royal mausoleum at Frogmore. 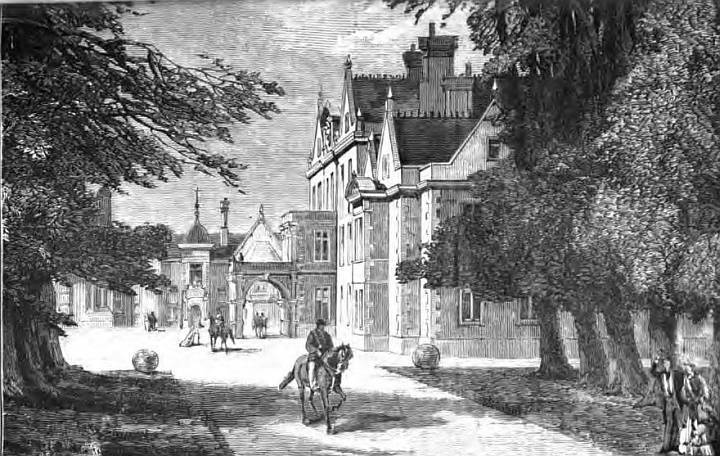 He started work on the service wing of Sandringham House in 1866, and completed the main house in 1870. In Jacobean style, with gables, cupolas, a turret and (among post-Humbert additions) stone bay windows, it is of brick with Ketton stone dressings (see Pevsner and Wilson 628). 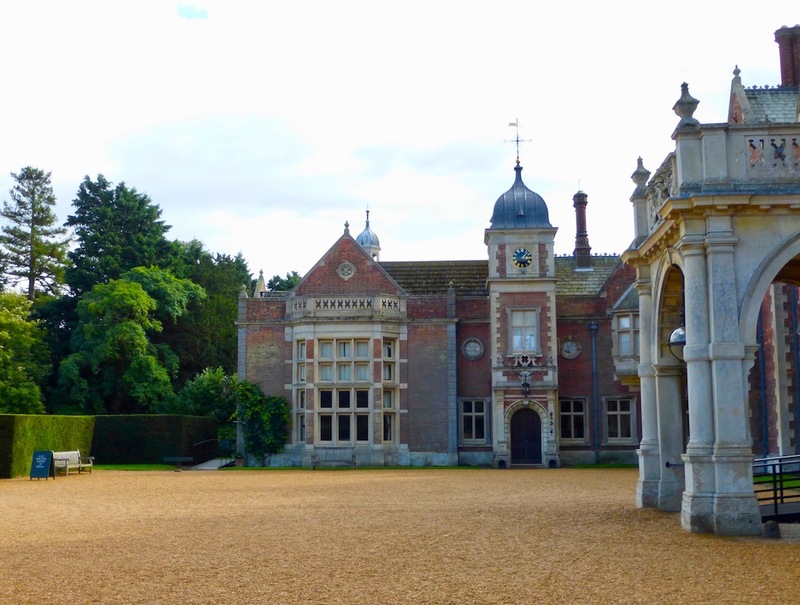 The estate lies in the parish of Sandringham, Norfolk. 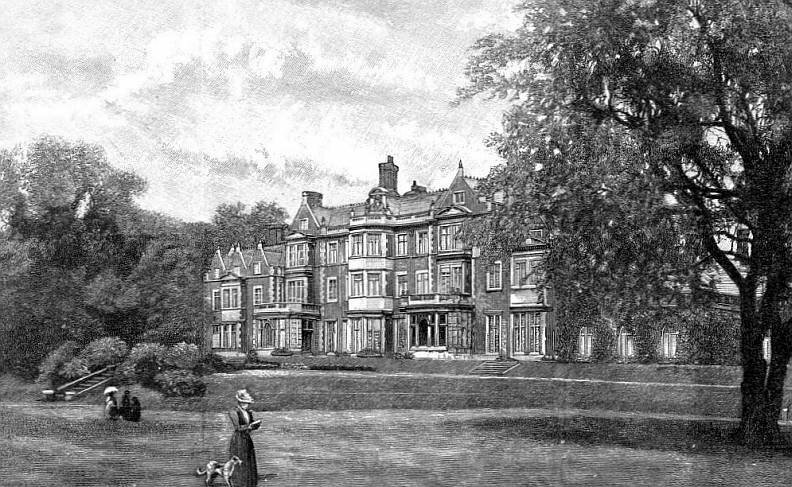 West front in 1893. Source: How, frontispiece. Humbert's own additions included a bowling alley like one constructed at Trentham, Staffordshire, by Charles Barry (see listing text), and the stable courtyard (later garages, and now partly museum). The late-nineteenth century enlargements were by the architect Colonel Robert William Edis (1839-1927) and were carried out in two phases, in 1881-84 and 1891, on the latter occasion after a fire. However, these were in the same style. 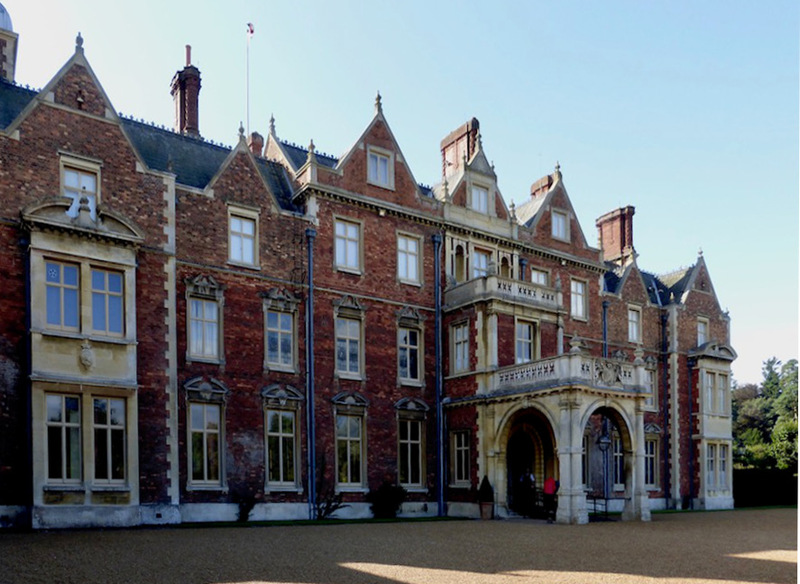 The chief interest of Sandringham House lies in its connection with the royal family. Lord Palmerston had spotted its potential as a country seat, and the property was then acquired as a "shooting-box" for Prince Edward. The house already there was subsequently demolished to make way for a grander one, with some influence from Blickling Hall, a Jacobean house in the same county (see Turner). C. Rachel Jones describes the result succinctly as "a good-looking, red brick house with white stonework, windows of modern form, and a picturesque irregular outline" (21). The east front. Left to right: (a) The east front in 1888. Source: C. Rachel Jones, between pp. 30 and 31. (b) The east front in 2018. (c) The east front in 2018 from the other side. 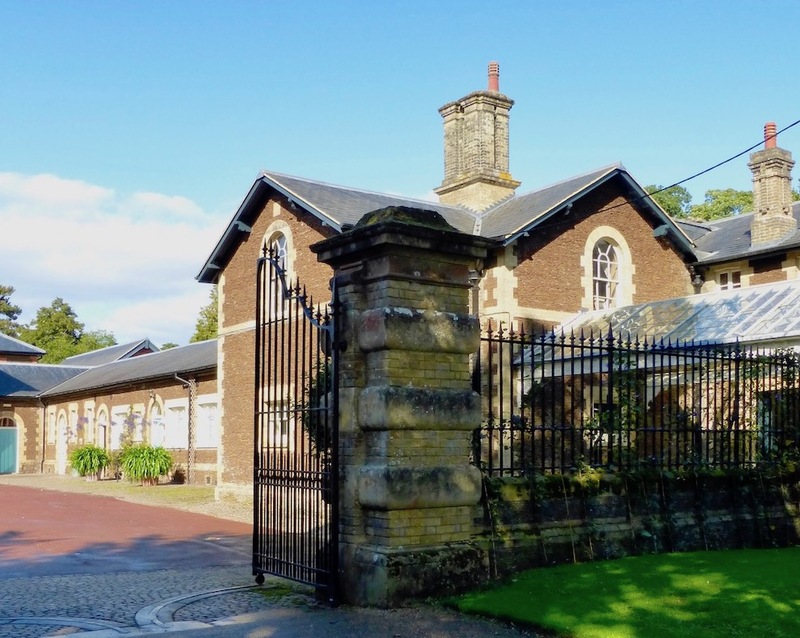 Others are more critical than C. Rachel Jones: "Vaguely historical in appearance, but without scholarly substance, it is pure mid-Victorian with its porte cochere, gables, bay windows, towers, turrets, and tall chimneys, all built in brick with pale Ketton stone details," writes Nigel Jones. Late Victorian illustrations. Left: The large drawing room. Source: C. Rachel Jones, between pp.58 and 59. Right: The principal conservatory. Source: How 333. Nigel Jones adds that that everything in the house "was and still is late Victorian dark abundance, with no surface left undecorated" (249). This comment also sounds negative, but of course such "abundance" as remains makes the interior intensely revealing for interior design historians. What had been preserved by the time these illustrations were made is not an Arts and Crafts showpiece but something more generally representative, if up-market. 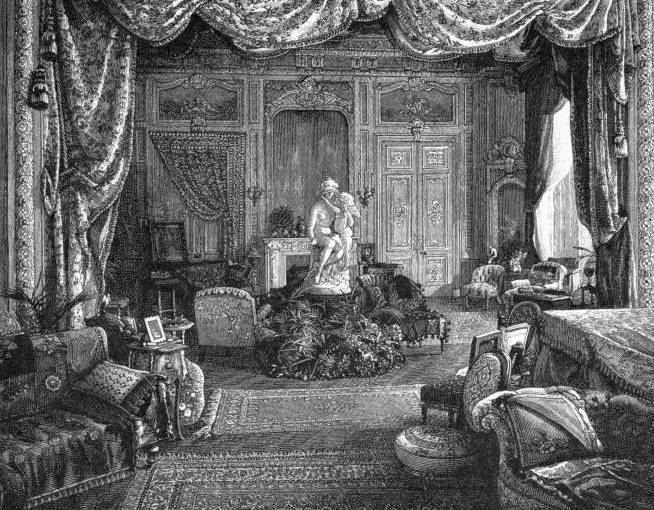 Note especially the staginess of the large drawing room shown on the left above, with its heavy, plush soft-furnishings (the hangings are of "rich chenille," How 332) framing a sculpture of Venus and Cupid in a surround of rocks and plants. A corridor ornamented with armour, swords, antique china, stuffed birds in glass cases, and so on, linked the whole suite of drawing rooms (see How 330). Also on display in the large drawing room, and probably in the rest too, were embroidery pieces, sketches, feather screens and other pieces of handiwork that showed off the skills of the womenfolk. In the late Victorian period, times were yet to change at Sandringham, and the royal household would have been particularly conservative. 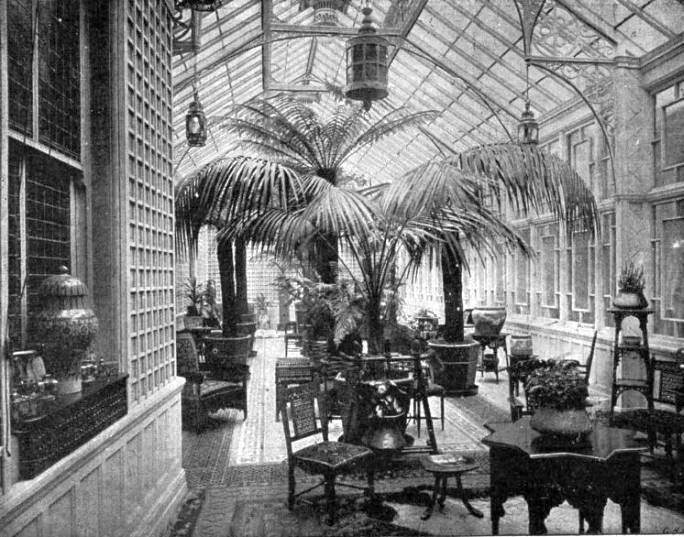 The main drawing room opened into the principal conservatory, seen on the right above. This had fancy ironwork in the light-brackets, and an array of the dramatic palms and giant ferns so beloved of the Victorians. The interior was quite up-to-date in its amenities, with the latest kitchen equipment, and gas lighting: there was an "estate gas plant" (Nigel Jones 250). 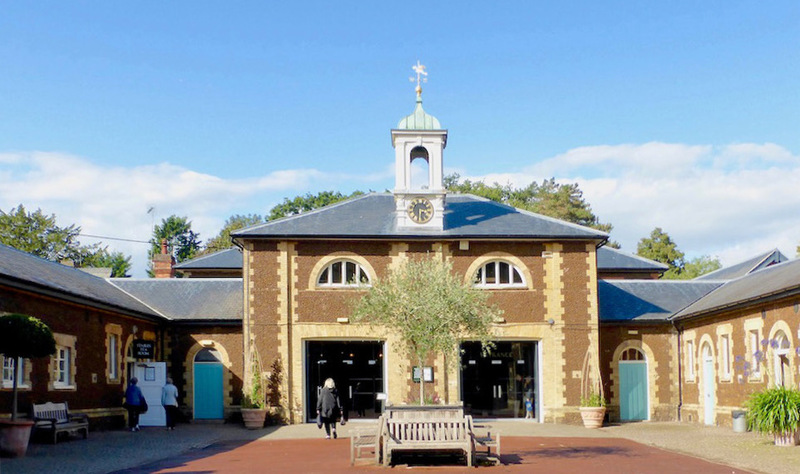 Left: The stable blocks round a courtyard (the central building is now the entrance to the Sandringham Museum). Right: Gates, and carriage lodge on the right-hand side of the courtyard. A view across the gardens from the south-west. The extensive grounds of Sandringham House include the large gardens visible from the west front. Some of the trees are of a considerable age, and two attractive lakes (Upper Lake and Lower Lake) were formed in the 1870s. But according to Nikolaus Pevsner and Bill Wilson, apart from these, the "arrangement" of the gardens dates from the 1860s (628). 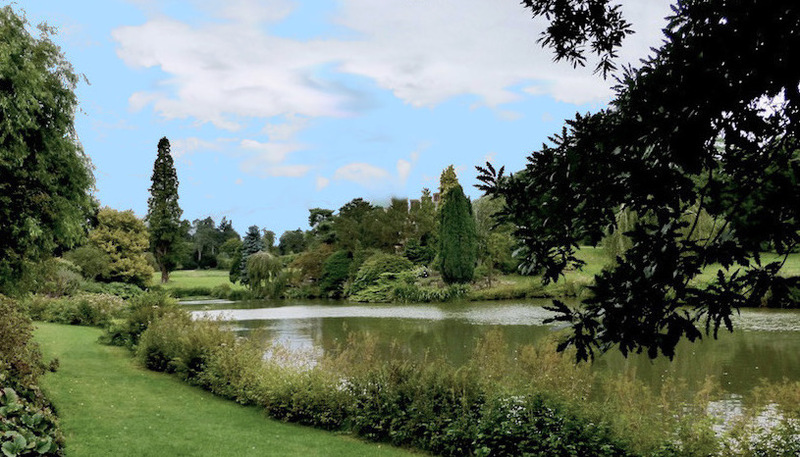 Within that general scheme, however, as might be expected, the gardens and the wider pleasure grounds have been subject to a process of "continual change and development ... since the late C19 and throughout the C20" (listing text). 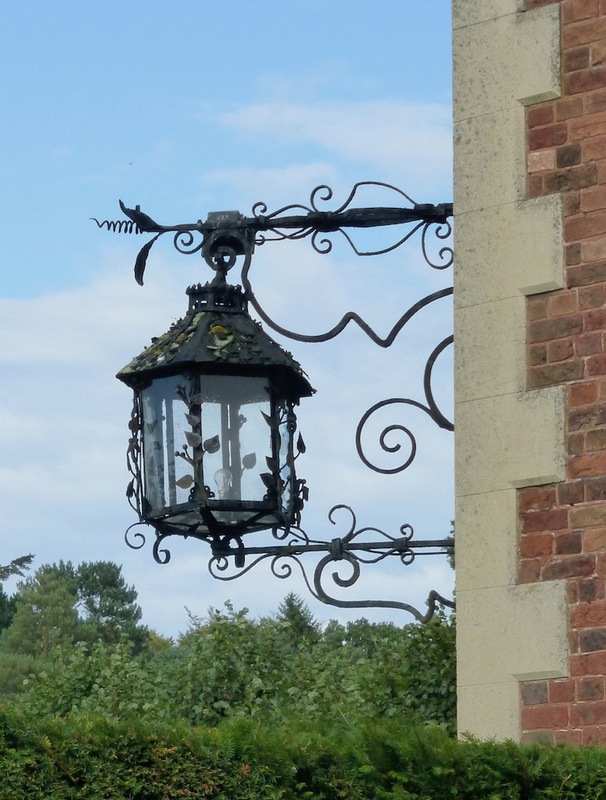 External light with intricate ironwork — possibly executed by Barnard, Bishop & Barnard of Norwich, the firm that made the celebrated Norwich Gates and provided the elaborate lamp standard near St Mildred's church (see Pevsner and Wilson 627). "What Was Victorian Taste, Really?" How, Harry. "The Prince of Wales at Sandringham." Strand Magazine, Vol. 5, No. 28 (April 1893): 327-39. Internet Archive. Web. 13 October 2018. Jones, C. Rachel (Mrs Herbert). Sandringham, Past and Present. London: Jarrold, 1888. Internet Archive. Web. 13 October 2018. Jones, Nigel R. Architecture of England, Scotland, and Wales. Santa Barbara, CA: Greenwood, 2005. Sandringham House. Historic England. Web. 13 October 2018. Turner, Michael. "Humbert, Albert Jenkins (1821-1877)." The Oxford Dictionary of National Biography. Online ed. Web. 13 October 2018.